These guys were super-heroes before there were super-heroes, and their adventures set many of the ground rules for the super-heroes who would come later. I have also been a fan of these characters for a very long time. Flash Gordon! The Phantom! Mandrake the Magician! Don't let the awful movies that two of these characters had to endure (or the equally awful live action TV programs) set your expectations for them. These are not campy characters. 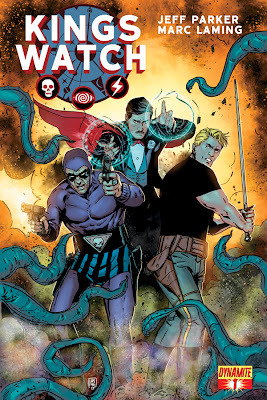 In honor of Dynamite Comics upcoming launch of these characters in the Kings Watch comic (named after the fact that all three were syndicated and owned by King Features), I am writing up Flash Gordon and The Phantom for Fate Accelerated Edition. I have to think a bit about how I would do Mandrake, so he may come in another post after the comic comes out. I think that I need to see how Jeff Parker is going to handle the character before I write him up. Gordon and The Phantom are pretty primal, so I think that my write-ups should match them regardless of what the writer has in mind for them in the upcoming comic. Because I am a Jungle Warrior, I get a +2 when I Sneakily create advantages when I’m in the jungles. I only gave these two the basic two aspects, I thought that leaving a couple of the aspects open would make it easier for GMs to adapt the characters to their settings as NPCs, or to allow players some space for customization if they want to play Flash or the Phantom. DC Comics has put the first three parts of a Wonder Woman short that is going to be part of their DC Nation block on the Cartoon Network. 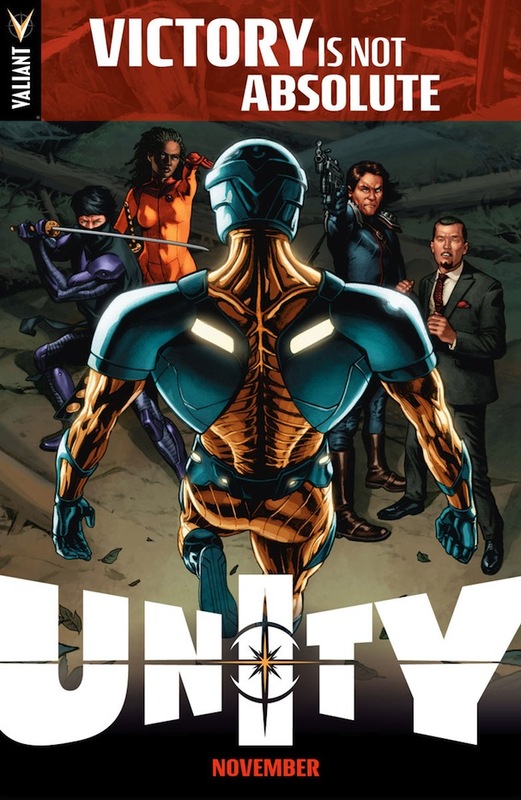 It is sort of Wonder Woman meets Aeon Flux meets The Prisoner set in the 1970s. Check these out. I hope you enjoy them. I know that I did. 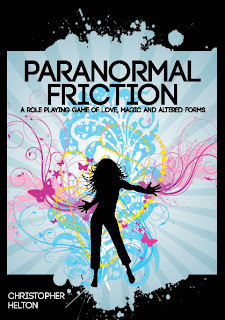 Hopefully next week I am going to be starting up a new bi-weekly campaign on Google+ called Paranormal Friction. Anyone who knows me knows that I am a huge fan of paranormal romance, and one thing that I have wanted for a long while was a role-playing game that tackled the genre. Well, I got tired of waiting, so I started work on my own game. 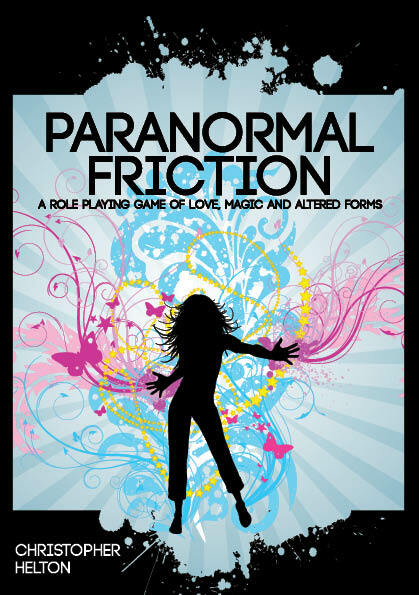 Paranormal Friction is a hack of the Fate Accelerated Edition rules onto which I am building guidelines for creating the characters from the genre. I am also hoping to work out a couple of sample campaign frames as well, because I think that giving worked examples helps when dealing with a genre that people might not be familiar with, or when dealing with people who might not be gamers (but fans of the genre) and would need a bit of guidance. I really like the simplicity of Fate Accelerated. It gets right to the heart of creating cool characters, and lets you get to the role-playing with a minimum of effort. Thanks to the guiding design principle of the Fate Fractal, it also makes it easy to design things for a game (like magic and supernatural abilities) without having to come up with a long list of new rules and excepts so that a character can cast a spell. My approach (ha!) is to use the approaches that help define a character also define a character's supernatural abilities, along with their high concept aspect. This should make for a game that doesn't need a lot of extra rules and just reuses the basic concepts of the game's design to do a variety of things. This is (probably) the first of a series of posts about the game as I work on it. Today I am going to post a sample character made up using the rules. The bit on the supernatural powers will probably be confusing, since it isn't in the baseline rules, but hopefully it will be easy to to figure out. This is a sample character, Jimmy Jam, a half-demon wannabe rapper. Imagine that the demon with the silly headband (the art is a panel from the excellent Justice League Black Baptism miniseries) is our boy, Jimmy. Jimmy wants to be a rapper. He mostly means well, but he has to deal with being the result of a night, regretted by his mother, that she spent in the bed of someone that she didn't know was a demon until it was too late. Jimmy has a lot of urges and emotions that he doesn't understand because of who his father is. He isn't always sure about the flames either. Jimmy has not yet met his father. Trouble: Who Is My Dad? Because I am a badass rapper, I get a +2 when I Forcefully attack someone in a battle of rhymes. And that is really all that there is to a starting character. That's the beauty of the system, for me. I write a paragraph with a bit of background and then go. Special effects artist Marcus Alqueres has done effects work on the movies 300 and Rise of the Planet of the Apes. Now he has done a short film that features a horror-take on the idea of super-heroes called The Flying Man. This seems like it would make for an interesting Call of Cthulhu scenario to me where instead of dealing with Mythos horrors, the characters would have to deal with enigmatic and inhuman superbeings seeking to rid the world (or their city) of crime. The characters could be criminals, normal citizens, or just people who live on the fringes of society. Wouldn't this make a cool idea? I know that you've heard of nerdcore music before, and while that can be cool I am really only going to listen to so much hip-hop music. 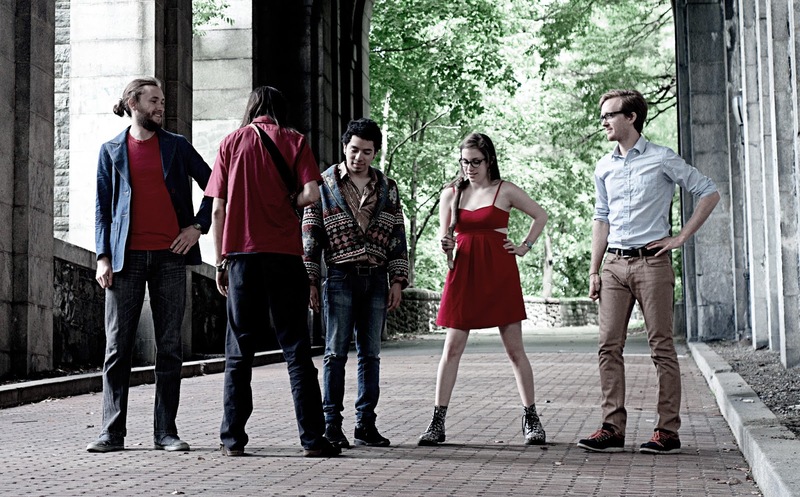 I was then surprised to discover that there was a nerdy band (doing music inspired by gaming and D&D stuff) that had more of an "indie" rock sort of vibe to them. 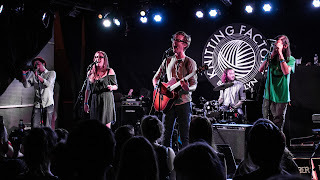 Think of The Lumineers or Of Monsters and Men (maybe with a harder edge at times) singing about their D&D game, and you have an idea of what the band Chamber Band sounds like. You should check the band out at their Bandcamp page and pick up their digital record Deities in your favorite digital music format. I really got into the songs Lawful Neutral and Shapeshifter. Asmodeus is well worth a listen as well. The production values on this record are slick and hold up to comparison with any mainstream or big label release you might be listening to. 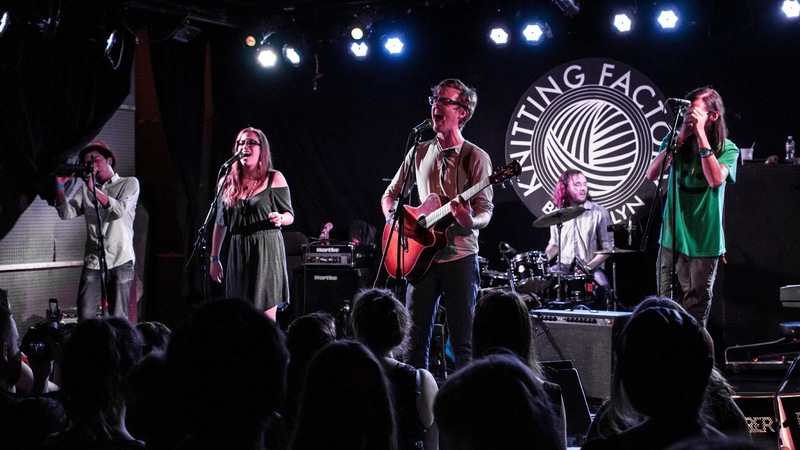 I am a fan of bands with boy/girl harmonies with their vocals, and Chamber Band delivers on that with crisp singing of well-written lyrics that you don't just have to be a nerd to want to listen to. Seriously, if you haven't already clicked on the link to their Bandcamp page and bought this, you need to do that right now. Gaming is about the DIY approach to things, and now bands can do the same thing (with sites like Bandcamp and many others). 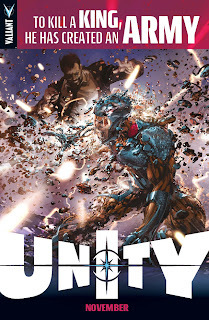 Just like how gamers can put together a game book that they want and need and put it up on sites like Lulu.com or RPGNow/DriveThruRPG and get it out to the people that it will connect to, musicians can do the same thing. 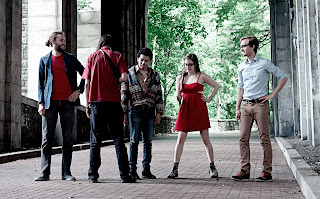 This is something that we should all support, because that cool virtual garage band of today could very well be the next big thing, and Chamber Band definitely has the talent to be that thing. All that is needed is that missing piece...you. Tell me what you think of this record once you have it. I'm curious to hear your takes on it as well. This record should be the soundtrack to your next D&D game. I'm not going to call him the 12th Doctor, because I think we all know better (and I'm pretty certain that they'll acknowledge the counting of John Hurt's Doctor after the anniversary special). But, in case you haven't already heard...they hired a new guy to play the part of the Doctor on Doctor Who. On the off chance that you haven't seen this on every other website in the world, check it out. This is a bit fuller of a video than what was broadcast on BBC America, so enjoy. Now begins all the speculation. I'm hoping for a new Master. 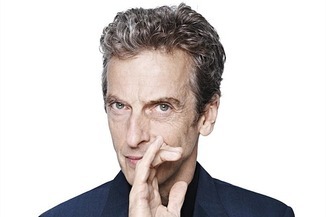 Perhaps Capaldi's Doctor will be the one to turn into the Valeyard? As long as you're here, click the tag and look at my other Doctor Who-related posts. As you know, about a month or so ago I received a shipment of classic Arduin material from Emperor's Choice, the current publisher/rights holder of Dave Hargrave's Arduin game and setting. Even with just a few of the books in the line, I have enough gaming material to keep me busy for a long, long time. As I have been discussing the Arduin stuff on Google+, one of the things that I brought up was that I wanted to see Hargrave's first attempt at a game (the early Arduin Grimoires were really intended as supplements to OD&D) as a stand alone game. Called The Arduin Adventure, this boxed set was a simple, OD&D inspired set of rules for fantasy gaming that could be expanded upon with the Arduin Grimoires. And now, The Arduin Adventure is available in PDF from RPGNow/DriveThruRPG. Dave Hargrave's Arduin and Steve Perrin's "Perrin Conventions" were influential in creating the West Coast style for D&D back in the late 70s and early 80s. Both of these lead to a style of play, and a style of game worlds that were different from the "mainstream" D&D that TSR was selling. This West Coast style lead to The Arduin Adventure and also to Runequest. There are references to DMs and designers like Perrin and Greg Stafford throughout the Arduin Grimoires. Like Bigby and Tenser in the OD&D rules, there are spells and monsters named for both Perrin and Stafford. So, what is the Arduin Adventure? It is a fantasy role-playing game, class and level-based, very much in the mold of OD&D. In fact, these codified rules owe a lot to the Holmes boxed set for D&D that helped to codify and mold those rules into something cleaner and clearer. The influence of Holmes' rules, however, are filtered through the imagination of David Hargrave. 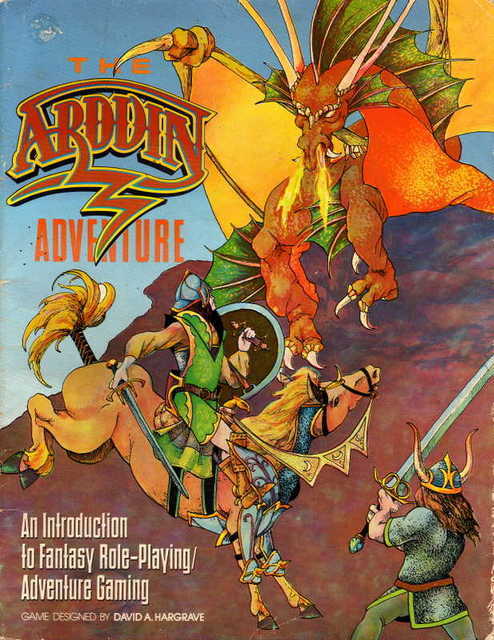 If D&D is Tolkien's Middle Earth and Moorcock's Young Kingdoms as filtered through the imagination of Gygax and Arneson, then Arduin takes those influences and a number of science fantasy ones (Star Wars being very important to Hargrave) and pulls them through the psychedelic experience that was the mind of Dave Hargrave. I consider this to be very much a plus because Arduin definitely has a much stronger voice to it than D&D did at the time, perhaps because it was the vision of one person instead of a growing committee. Don't get me wrong, D&D is a great game (I play one of the retroclones of OD&D on a regular basis), but it does not have the voice to it that Arduin has. For some this might be considered a weakness, but I think that it was a strength of the game. I believe that Arduin was the first RPG that was as much the vision of its author, rather than just a way to come up with some rules that could be used within a certain genre. I think in this way, Arduin is the spiritual father of games like Kevin Siembieda's Palladium Fantasy and Rifts. There are a lot of similarities between Arduin and Palladium Fantasy to me (but that is probably something for another post). Now, while The Arduin Adventure has everything that you need to play, it is really not a complete game. Much like how the Holmes version of OD&D covers only the first three levels of play, so does The Arduin Adventure really only cover the equivalent for Arduin. You have enough to get play started, and play for a bit before having to "upgrade" to a fuller version of the rules in order to continue. If you have The Arduin Adventure and the first three (at least!) Arduin Grimoires you can fill in a lot of the gaps and play for a while. If you're interested, Emperor's Choice does offer a print version of The Arduin Trilogy that contains the first three of the Arduin Grimoires and The Arduin Adventure. This thick book will give you a lot of gaming, whether you use Arduin's native rules, or plug them in to D&D or some retroclone of it. If The Arduin Adventure whets your appetite for Arduin, then I really recommend getting the Trilogy in print. All of the things that are familiar to OD&D players will make Arduin easy to pick up. The classes are basically the same, races are handled in a similar manner, and spells and advancement are very similar. Moving between the two games would be ridiculously easy. Picking up Arduin will not be difficult, if you already have a familiarity with OD&D or various OSR games that duplicate the experience of it. If you aren't already familiar with the "old school" approach to fantasy games, Arduin may cause some problems for you because it does assume a familiarity of that style of play. However, at 66 pages, reading Arduin and picking up the rules shouldn't be that much of an investment of your time. 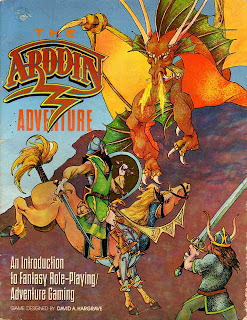 Whether you want to pick up Arduin in order to learn about an old school game that you may not have known about previously, or if you want to pick it up because you want to supplement your OD&D/OSR games with some new material, I think that you should be picking up The Arduin Adventure (and then moving on to as many other of the Arduin Grimoires that you can find). You will not be disappointed. Combat is a bit more complicated in Arduin than in OD&D. Dave Hargrave liked his critical hit and fumble charts. Each weapon hits differently, depending upon the Armor Class of a character's opponent. This looks more complicated, but the combat tables in The Arduin Adventure and The Arduin Grimoires make this process much simpler than it should be. Regardless, this is still OD&D at its heart, and that game really only gets so complex. Some may see this added complexity as a boon in their old school games. On the negative side, this is an ugly PDF, however as it is a reproduction of the original game (layout warts and all), I don't know that I can hold that too much against the publisher. Much like with the older edition D&D PDFs available, this book is an artifact, a reflection of its time. If pretty and shiny is a requirement of your role-playing games, then The Arduin Adventure may not be for you. However if you like rough and tumble RPGs that do at the table what they say they will, you will want to pick this up for your gaming library. And then, go to the Emperor's Choice website and buy more Arduin stuff. All in all, if you like old school style D&D and you haven't already experienced Arduin, you should buy The Arduin Adventure and kick the tires. I think that you will like what it can bring to your gaming table, even if it is as a supplement to your OD&D/OSR game of choice. Go out now and get your copy. I still have some more Arduin posts in me. There's a lot of material in the books that I have, and a lot to talk about. I may try to run Arduin, or perhaps an Arduin-influenced Swords & Wizardry game. Really, I think that the only thing that I could ask of the publishers of Arduin to do is to open up some of the content of the game (spells, monsters, maybe even some of Hargrave's original races) under the OGL so that homebrewers and hobbyists and pull Arduin into our games, and maybe even share what we've done with it. What does it all mean? 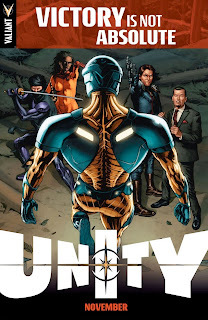 Unity comes to Valiant Comics. 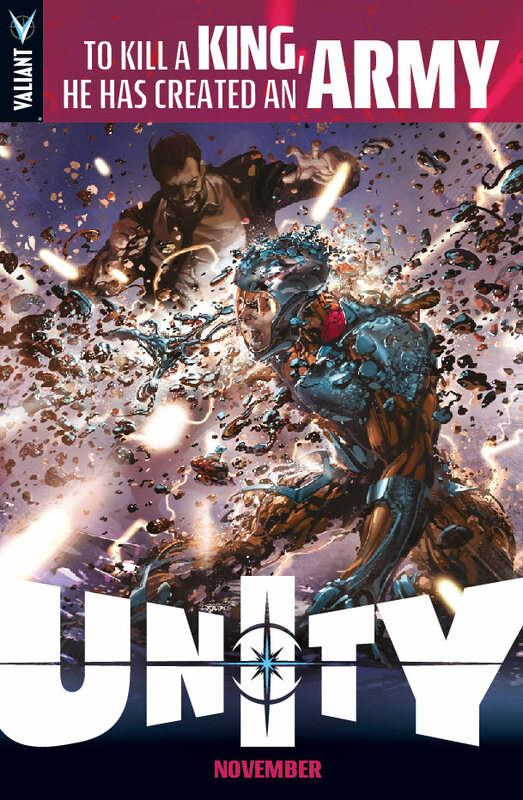 The original Unity was the blueprint for the modern comic event, so what will happen this time? We will find out in November, I would guess.